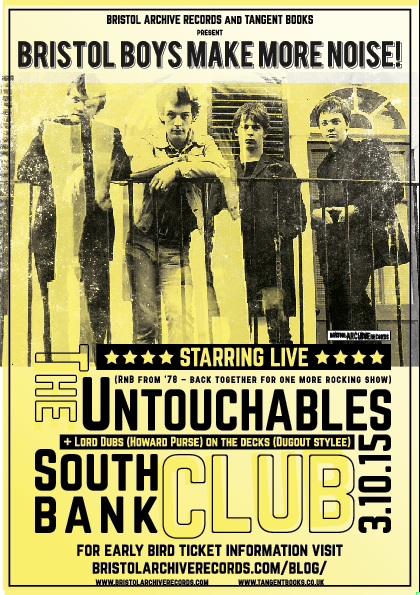 The Untouchables – Gig! – Bristol Boys Make More Noise!!!!!!!!! Those under the illusion that BRISTOL BOYS MAKE MORE NOISE Gig#1 The Spics, was a one hit wonder need to get down The SouthBank on Saturday October 3rd for another act from the archive as we move into ‘annual event’ status. The launch of the book and album BRISTOL BOYS MAKE MORE NOISE which visits the Bristol Music Scene 1974 – 1981 has spawned a desire for repeat of the good times. 39 years 11 months before Gig#2 Dr Feelgood played the Colston Hall and two barely teenage boys went to see them and got the blues. Jerry Tremaine and Marc Clements formed THE UNTOUCHABLES an R & B band modeled on The Feelgoods, playing their covers and guided by their 50’s/60’s influences. BRISTOL BOYS MAKE MORE NOISE the book, contains John Spink’s photos of an early gig at The Bear in Hotwells, Gill Loats in her anecdotal text takes some credit for Tremaine’s talent, due to her irresponsible ‘babysitting’ and the track on the accompanying album Keep on Walking, is the one Wilko Johnson produced. Another opportunity to buy the book, album and the T Shirt at Gig#2 with DJ LORD DUBS to fill in the in-between bits with ‘music to watch the years go by’ and our headliners THE UNTOUCHABLES authentic rhythm and blues ensuring another great BRISTOL BOYS MAKE MORE NOISE gig. 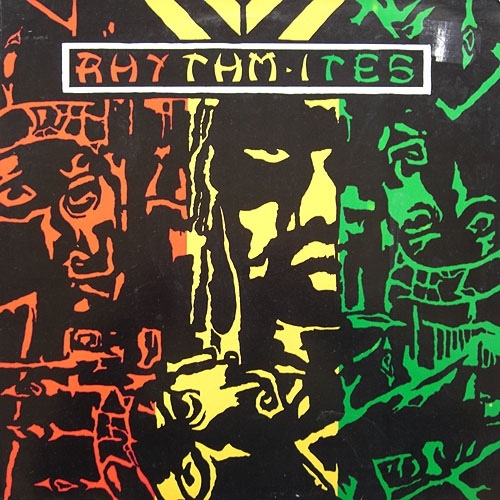 Originally formed in the mid-eighties, Bath based reggae outfit Rhythmites spent more than a decade gigging throughout the UK and Europe, building up a loyal fan base and a strong reputation as the West Country’s leading proponents of live roots reggae. Although their catalogue wasn’t excessively large, they did manage to record and release a couple of cassettes, a 12” single and most memorably in 1989, a very well received vinyl only album, “Integration”. Rhythmites split up in the year 2000 but in 2007, they picked up where they’d left off and once more began spreading the roots reggae message at live shows as well as recording new material. With all the renewed activity, many fans both old and new have been asking about “Integration”, an album released only on vinyl more than twenty five years ago, long deleted and not readily available on the used market. As chance would have it, Rhythmites and their music were already on the Bristol Archive Records radar so; when they mentioned the possibility of reissuing “Integration” we were very happy to be of assistance. We discovered that the band had never been entirely happy with the original mix and wanted to remix the album with the benefit of twenty first century facilities. Remixes can be a bad thing but as someone who saw the band perform many times and bought “Integration” on release, I was blown away by the new mix. Not only have they remained totally faithful to the original with no badly judged attempts to update the sound, but engineer Ben Findley has totally nailed it with the new mix; it takes the original to another level, improving it whilst maintaining the spirit of the vinyl pressing. For those that aren’t familiar with the band this is a roots album, the songs deal with living one’s life in a better way. The sound is authentic and not in any way contrived, in no small part due to Angus’ excellent and distinctive vocals which really fit both the music and the lyrics. Anyone who has seen them perform live will know about Stuart’s didgeridoo and that makes an appearance right from the start in “No Guns”, a song that suggests it doesn’t take weapons and violence to be a freedom fighter. Other stand out tracks includes “Nation Integration” with its call for unity, and “Pain and Suffering” which shines a light on some of the ills of the world. The rest of the tracks all deal with serious issues although, “A True” and “Hold On” drift into what was, when recorded, a more contemporary almost dancehall style. As a bonus we’ve included brand new exclusive dub versions for “Heed No Dream” and “A True”. It’s great that one of the best live reggae bands of the late eighties and nineties are back on the road, as is the fact that their first album is getting a long overdue reissue, the fact that it’s sounding better than ever is the real bonus. “Integration” by Rhythmites is released on CD and digital download by Bristol Archive Records on the 18th September 2015, available from all usual outlets.